Popular, but tiny consignment boutique, Jane’s Again, became much larger with its recent renovation. With careful space planning, specific colour placement and furnishings that accommodate and showcase merchandise, there’s so much more room in this little shop. Not a square foot was added, yet guests continually congratulate the team on doubling their retail space! Bright, fresh and spacious – now, it’s more fun than ever to shop at Jane’s Again! On sought-after Main Street in Wolfville, there was no chance of increasing the floor space, and with the boutique experiencing rapid merchandise turn-over all, reducing the quantity of inventory on display was not a possible solution. 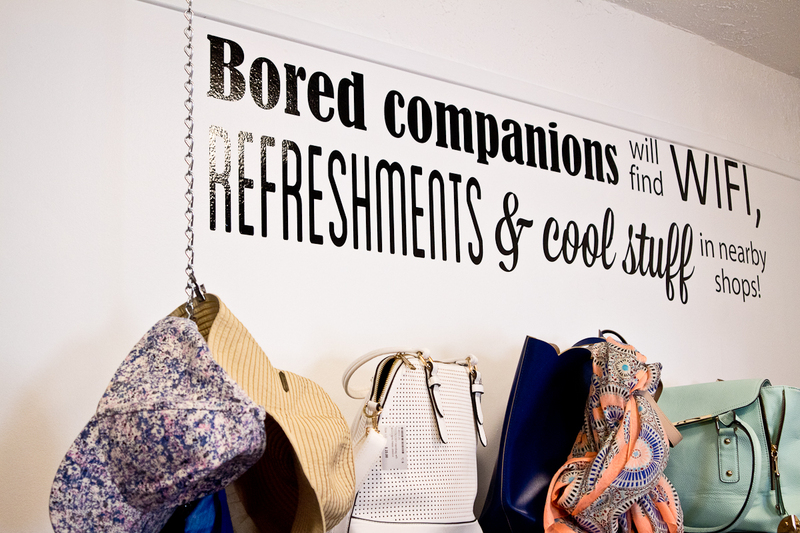 Solutions came through managing traffic movement through the shop with layout, improved merchandise accessibility, and a clever sign suggesting bored companions would enjoy being elsewhere. Relocating the change rooms and removing their walls improved traffic flow, gained valuable inches of floor space and helps prevent shoplifting. Emphasizing the cash desk with a chandelier and colour blocking projects a confident and in-command air. Colour and light visually raised the low ceiling and unified the chopped up space, creating a fresh, friendly and inviting shopping experience.